Korley at U.S. Chess School! 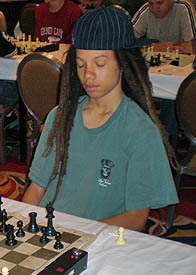 IM Greg Shahade told The Chess Drum that National Master Kassa Korley is part of the training by the “U.S. Chess School,” an initiative to help the nation’s juniors refine their skills. The camp is taking place in Scottsdale, Arizona and it will last from January 1st-5th. U.S. Champion Yury Shulman will conduct the workshop. This initiative was founded by Shahade, who is more known to the chess world for his blitz, poker and his highly-successful chess league. He was a one-time Sanford Fellow for promising players, but it appears he has decided to put energy in helping to build a competitive atmosphere in U.S. chess. In a few years, he may see his innovative ideas bear fruit.